Of heaven on earth, the mythical Atlantis. Spilling down a vacant slot. To meet his girlfriend, at the local Pizzeria. Another gambit in a matter of seconds. That God gets the arithmetic of your lifespan right. Just like a cancer ward, where leukemia patients rest. At least here, you’re given an advanced notice. A bullet in the back, with no shot at growing old. In a game of street craps. Like two pips in snake eyes. Dr. Dilantha Gunawardana graduated from the University of Melbourne, as a molecular biologist, and moonlights as a poet. His poems have been accepted for publication/published in HeartWood Literary Magazine, Canary Literary Magazine, Forage, Kitaab, Eastlit, American Journal of Poetry, Zingara Poetry Review, and Ravens Perch, among others. 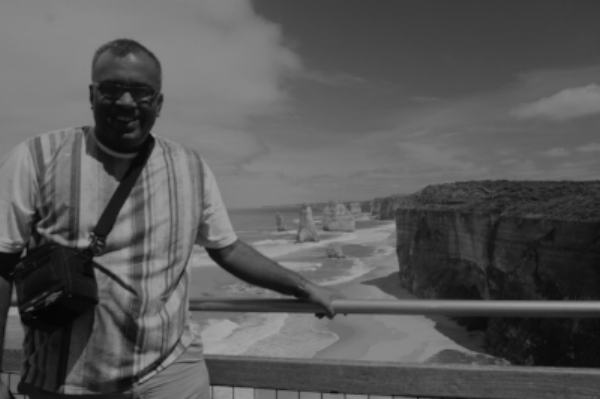 Dilantha lives in a chimeric universe of science and poetry and is a dual citizen of Sri Lanka and Australia, sharing his experiences from two different cultures. Dilantha has two anthologies of poetry, Kite Dreams (2016) and Driftwood (2017), both brought to the readership by Sarasavi Publishers, and is working on his third poetry collection (The Many Constellations of Home). Dilantha blogs at https://meandererworld. wordpress.com and can be reached at dilanthag@yahoo.com.au.